At a session during Nenagh Castlefest 2018, a group of musicians which includes 5 flutes, play a selection of reels ending with “The Union reel”. 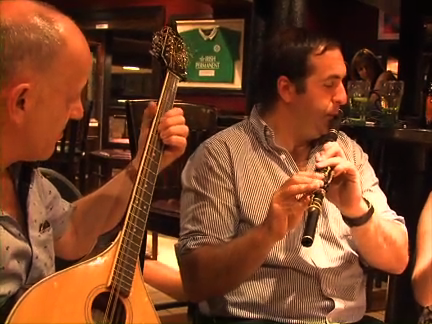 They are Brian Hourigan (Nenagh) bouzouki, David Crowe (Clare) flute, Geraldine O’ Meara (Nenagh) flute, Sharon Kelly (Mullingar) flute, and her sister Leona McKenna on whistle, Ruth Morrissey (Nenagh) flute and Jim Lawlor (Nenagh & London) on flute. Recordded on 30th June 2018 in Hi B bar & restaurant, Nenagh.